There have been developed super heat-resistant alloys for promising gas-turbine engines (GTE) of the 5th and 6th generation,and technologies of making such alloys. Techniques are indicated that allow, during melting, to considerably reduce harmful impurities contents, narrow the alloying intervals, considerably increase the yield, and, in terms of quality, reach the world standard levels. On the basis of the investigations conducted, there has been developed a technology of recycling 100% of foundry waste of engine producing plants and GTE blades after operation on engines. It is shown that the waste recycling by the developed technology makes it possible to produce cast barstock from heat-resistant alloys that by its quality is not inferior to metal made of new charge materials. Makhov S.V., Popov D.A. Inoculation of Hypereutectic Silumins with Al-Cu-P and Al-Fe-P Master Alloy The article discusses problems and prospects of making Al-Me-P master alloys from Cu-P and Fe-P alloys, state diagrams, section microstructures, as well as process parameters of making those master alloys by various methods are presented. Key words: master alloy, aluminium, copper-phosphorus, ferro-phosphorus, induction furnace, briquette. Karacharova Y.G., Mironov A.Y. Antifriction Aluminium Alloys with Enhanced Properties Possibility of using parts from cast aluminium antifriction alloys in friction units is analyzed. Using ThermoCalc software, there have been built and analyzed polythermal and isothermal sections of state diagrams of Al-Sn-Cu, Al-Cu-Si-Zn. Level of mechanical properties in Al-7%Sn-2%Pb-Cu alloys with different copper contents, as well as the microstructure and mechanical properties of Al-Sn-Pb-Cu-Zn-Si system alloys have been evaluated. Key words: antifriction alloys, cast aluminium alloys, plain bearing, microstructure, mechanical properties. Petzschmann U., Wolf G., Stets W. Evaluation of the influence of different carbide forming elements on the microstructure and the properties of the ferritic ductile iron The paper presents the results of a research project. The subject of the activities wasto investigate and evaluate the cumulative effects of carbide stabilising elements on the microstructure and the properties of thick-walled castings in ferritic cast irons like EN-GJS-400-15. The project was inspired by the increasing occurrence of tramp and trace elements in the cast iron materials by the use of steel scrap and its influence on the microstructure and the properties of ferritic cast irons. The objective of the project was the development of quantitative rules to predict the level of carbide in the microstructure and its consequences for the mechanical properties. Key words: carbide-forming elements, nodular iron, ferrite, pearlite, microstructure. Konokotin S.P., Moiseyeva N.S. Effect of Electromagnetic Field on the Properties of Intermetallide Ni-Al Alloy The article discusses the possibility of enhancing physical-and- mechanical properties of metal in a ceramic mold by the method of electromagnetic action during its crystallization. Enhancement of mechanical properties of intermetallide alloys will allow, when they are used, to resolve a complex of problems in various fields of engineering. Key words: electromagnetic field, intermetallide alloy, vacuum-induction unit, shell mold. Cornelis Grefhorst, Marl Testing of Bentonites. Evaluation of their Properties and Use in Practice It is shown that the montmorillonite content is important for bentonite quality. Other requirements to bentonite properties – thermal stability, mixing rate in molding sand, resistance to system factors influence during sand turnover – have also been formulated. Key words: molding sand, binder, additions, sand preparation, humidity, shakeout capability. Bazhenov V.Y., Koltygin A.V., Gordiyevskaya M.V. Methods of Reclaiming the Material of Molds Made on a 3D-Printing Unit S-15 The possibility of reclamation of waste S-15 moulds (ProMetal equipment) was considered. Reclamation of moulding sand of this type is not provided by plants up to this time. Various methods and reagents used for reclamation of moulding sand were tested. The optimal temperature for thermal regeneration 450…600°C was determined. The chemical reagent for a wet reclamation of moulding sand was found. 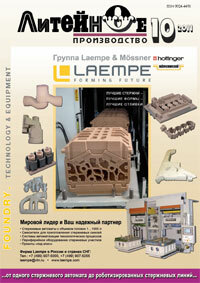 Key words: reclamation of moulding sand, No-Bake process, ProMetal S-15, RP-technologies. Kvasha F.S. Simulating the Stabilization Process of the Facing Sand – Filler Sand System. Part 2 A system of calculations is proposed allowing to analyze the influence of foundry mold parameters available to a foundry technologiston the selection of optimal refreshing and consumptionof materials, stabilization process of the facing sand – filler sand system. Calculation examples are given. Calculation results are estimating and substantially depend on the reliability of basic data. Therefore they must be adjusted by taking into account the balance of materials in the sand preparation system in question. Key words: simulation, facing sand, filler sand, stabilization, steel castings, calculations, refreshing, material consumption. Gilmanshina T.R., Mamina L.I., Baranov V.N., Bezrukih A.I., Popov S.A., Litkina S.I. Properties of Foundry Suspensions Based on Nanostructured Graphites Studied the dependence of wettability of cryptocrystalline graphite from deposits of Krasnoyarsk region of its modes of nanostructuring by mechanical activation, determined the optimal regimes of preparation of graphite and studied the properties of aqueous suspensions based on natural and nanostructured graphites. Key words: nanostructuring, mechanical activation, coefficients: limiting wetting angle, adhesion, work of adhesion, spreading, relative work of adhesion. Gerasimov V.V., Visik Y.M., Bakerin S.V. Production of Lengthy Castings from BKHA-1B Alloy by Directional Crystallization There is shown a possibility of making thin-walled lengthy parts of a jet nozzle with controlled thrust vector from intermetallide BKHA-1B alloy with a single-crystal structure (SCS). Some process regimes of making such parts on a unique directional crystallization (DC) plant UVNK-10 are presented. Specifications of the plant and its computer control system are given. An experimental lot of spacers with SCS have been manufactured that are suitable for testing in the product. Key words: single-crystal castings, intermetallide high-temperature alloys, equipment for directional crystallization. Batyshev A.I., Bezpalko V.I., Batyshev K.A. Wire Production by Casting with Crystallization under Pressure The article is dedicated to studying the possibility of making aluminium wire by plunger action on the melt in die casting. Die design, process parameters and characteristics of wire metal are given. Key words: wire, aluminium, crystallization under pressure, plunger, die. Bazhenov V.Y., Koltygin A.V., Gordiyevskaya M.V.